Just a reminder: If Lyn gets screwed out of a spot in the base game by Celica, the FE16 lord, or something else entirely, it's pretty safe to say that Lyn is very likely to be DLC. People would definitely pay money for her exclusively and being DLC relieves the pressure of making it into the fabled "base game" roster. Nah, who am I kidding, all FE content will just be from FE16 at that point just like how we had Fates crammed down our throats for 3 years. Does this have to do with the Emily thing? I'm of the opinion that if she doesn't make it in base she'll just stay an assist. Which is a shame too, as someone of her status keeps getting shafted. Now i'm worried that a leak could possibly dash my hopes, if someone knows something, i'd rather know now then later. No, not at all. The Emily thing could help Lyn since Lyn is popular and she “would make a lot of people happy.” It’s not conclusive at all and it’s still just a rumor though. Does this have to do with the Emily thing? I'm not familiar, what Emily thing? I think they should swap out Lucina and Lyndis. Two characters from Awakening was overkill. So YES I support Lyndis, but only if she replaces Lucina. Non-clones can't replace clones. That's not how development works. Emily Rogers is a well-known insider within the leak community. She's made many claims and while some in the past were false, she's been on a hot streak recently with leaks. Over the past few days, she and a few other leakers are cross-"confirming" info that is being leaked: Pokemon, Star Fox, etc. One notable thing she said yesterday that was speculated upon in the main Smash Switch general thread is that the roster will have people "jumping out of their seats", that it will "please many", and that this will be the "ultimate Smash game." It can be considered subjective to Emily what a good roster is and the fact Nintendo would work their hardest to make each Smash great anyway doesn't really matter. IMO, I believe some characters (like Lyn) would have higher chances if Emily is right due to the fact that they would fit into the category of "pleasing many". Awakening only got 1 full character and a fraction of another. Lucina was barely any extra development, losing her does not equal a substantial amount of dev time for a fully new character like Lyn. Does she know how popular Lyn is? Don't know if we will get a new FE character in base considering that she said that there would be possibly no cuts and adding another FE character will piss people off. Idk if Emily exactly knows Lyn’s popularity. However, while any FE character will piss people off, I’d say Lyn would be the one to get the least hate tbh. 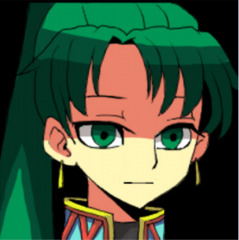 I feel like the Smash community’s existing exposure to Lyn and her lasting popularity would make it a bit more bearable. Don’t think anybody that frequents the Smash, FE, and Nintendo communities could ignore Lyn’s popularity. She's kind of a big deal. Definitely my top Fire Emblem repersentative, only second to Ike. Seriously, despite wielding a sword, the way she uses that iaijitsu with the dozens of cool animations definitely gives her enough amunition to be unique. Also helps that she is one of my favorite FE characters, far more than Roy, probably my least favorite Lord. Side note: I think it'd be funnyl if Mark was referenced by just being a model clapping far in the distance of her victory screen. Things are looking up, my dudes/dudettes. Also, when will SmashBoards stop crashing my images? We could be seeing no new FE members, that Celica tweet doesn't mean a whole lot. Perhaps. But like DNeon said we could see none. However Vergeben PM'd me about awhile back (I asked him about lyn) and he said he personally feels fire emblem will get at least one newcomer but as of now he doesn't know more than what he knows so far, out of respect I won't post it but I feel as if lyn has a legit shot now, but I won't be careless because we never know. Linking to my RTC post about Lyn. Word that Celica's voice actor isn't working on Smash is not surprising to me. I actually don't think Celica had much of a chance. Before Echoes, her game was the least popular in the series, and she did not have very much to bring to the table to differentiate her from Robin. With still no word on the Switch game in the series, I think that there's no chance of getting a character from that game. Sakurai debuted one character from that series due to a delay (Roy), and he introduced Corrin to the West before we got Fates, but I don't think that's a trend he's actively planning for. I still think Lyn is the most likely character from the series to make it as a playable character. I just don't know if we're going to get any new Fire Emblem representation in this game. Although getting Lyn in Smash Bros. would be hype for me (she's my favorite gaming character, but I'd be more hyped for Isaac, TBH. Golden Sun needs the love way more than Fire Emblem does), what I really want is to learn that they're planning on making "Fire Emblem Echoes: Blades of Elibe", a remake for the Switch of both Blazing Blade and Binding Blade that lets us revisit that world. Get Mark as a playable Tactician much like Robin, watch Lyn's story more fully fleshed out (maybe even get her own path), have her show up in the sequel as a powerful lategame unit, etcetera. She's now definitely known to be one of the most popular characters in the series, and Intelligent Systems have had no problems exploiting that. Even if she misses Smash, I just want to see her in a full Fire Emblem game again. At this point, I've come to peace with potentially not having any new FE characters... on the base roster. If Lyn doesn't make it into the base game, she's pretty much as close as you can get as a lock for DLC. IDK about an Elibe Echoes though. They still have to remake the Jugdral games, and like the Elibe games, it would be hard to put both games into one remake. Lyn's story getting a remake is possible, but it seems very far off even at best. If they do make Shadows of Elibe, they better buff Lyn and Eliwood and promote Roy faster. I agree, when I said it's possible we get no FE characters (and IMO it's fairly probable since Sakurai doesn't really tend to look back in time through series already represented) I did mean purely for base roster, any polls and future games to come out would obviously change the landscape for DLC. Assuming that they're going in order. But the director of Echoes said that he was most interested in remaking Binding Blade. Combined with Lyn's current sky-high popularity, Intelligent Systems may well want to cash in on Elibe sooner rather than later. Well, regardless of New Smash getting any new FE newcomer, Celica being temporarily taken out of the picture for the base roster does give us a clearer picture of who may or may not be added to the base roster. And with FE16's protagonist still being a non-entity (I swear if we don't get any news at E3) It now only comes down to a handful of characters. If any of these three get in, I'll be over the moon. There is always the possibility that a Heroes character can get into Smash but I'm not so sure Nintendo is 100% ready to cash in on their mobile division (Maybe they'll see how Let's Go does). I doubt it. We might get a Heroes character in the Switch game as an Einherjar or something. We won’t see them in Smash yet, though. Well, tomorrow the showcase begins. I'd like to thank deathlightning for keeping up the lyn support around here, whatever happens, I'd just like to thank all of you for believing all the way. D'aw, thank you so much~! Welp, today is the day guys and gals and others. Either we'll have Lyn or we won't. I just want to say that whatever happens, Lyn getting into Smash or not, that we do not act like total chodes about it. We won't go attacking other Fire Emblem threads if they're characters get announce NOR will we go bragging about it to other fire emblem threads. Let's all try to be mature adults about this...after we're all done screaming our collective heads off about Lyn getting into Smash. Lyn's an assist again. Long live Lyn. It would seem that they won't bother upgrading any assist as takamaru is also RIP, heavily reused assets, there probably won't be many new fighters because everyone wanted vets back. So I expect many disappointments newcomer wise. Lyn is an assist again, and that's about it for her, don't expect IS to reference her much in the future. Maybe if they didn't focus so much on vets... but it is what it is. Um, she's still the most popular character in the franchise, and she still has a ton of fan support and appearances. Heck, she's the first unit with 5 different versions in FE Heroes. IS will continue to reference her. As for promoted ATs... I'm holding out hope for Isaac still. 15 years since the original release of FE7. I can wait 15 more. Sorry it was not possible guys. Yeah, guess we just hang out for her remake...though despite her ridiculously overwhelming populatiory that's obviously still going to need to fall right at the perfect time for her to ever be included. Not sure about you guys, but I've already been bothering Sakurai on twitter about DLC. This assist business isn't going to cut it this time! Sign.still resorted to assist trophy for the third time in a row.hugely dissapointed. Do not fear friends, If all preconcieved notions have already been broken before (only nintendo all stars, only nintendo characters, only one third party character per franchise, Ridley is too big), then the impossible is truly possible. What rule states an assist trophy cannot also be a character, we have three links, I'm aware that situation is a little different, but nothing is ever concrete in smash and new rules come and go. I expect a new smash ballot to come soon. Now you can sit there and recount the tales of when Lyn almost was in Smash, or you can ride together with me and lead the charge with a mind clear of regrets and a heart full of courage. I know what I ask of you is no small task, nor a simple one. Are army is not the most, numerous nor influencial, nor widely supported, but it matters not. I have faith in all of you and know our bonds give us strength. If we can garner some support as well as rally supporters I believe we may have a chance. We didn't recieve Lyn this time but that just gives us time to regroup and prove ourselves. For the glory of Sacae! If not already implemented then there would certainly be an awkward implementation to prevent certain characters from appearing from assist trophies while they're being played. Otherwise I do agree, with enough fan demand and hassle it's certainly possible that assist trophies can make the transition within their own games as the DLC comes. EDIT: Note that I don't think it's likely, but clearly Sakurai is leaning more towards fan demand nowadays than any existing 'rules'. I agree with this. Lyn fans have to be vocal like the daisy and ridley fans were, otherwise we'll end up losing it to the new axe lord. But I also suggest asking Nintendo for an FE fighting game, that could also be something lyn could get into. While Ultimate looks great, it's incredibly disappointing that she's STILL an assist trophy. We held out hope, but sadly it would seem that a playable Lyn is not in our foreseeable future. Although she's been confirmed as an assist trophy, I still definitely support her. FE7 was my second Fire Emblem game (after Awakening) and Lyn is a very great character in it. WHO DARES RESURRECT THE LYN FANS. Wendee Lee not voicing Lyn in Smash Ultimate is extremely disappointing. If they were going to make the most popular FE character an Assist yet again, then at least update the weakest part of her Assist Trophy.